the innermost secret unsurpassed cycle (Tib. ཡང་གསང་བླ་ན་མེད་པའི་སྐོར་, yang sang lana mepé kor; Wyl. 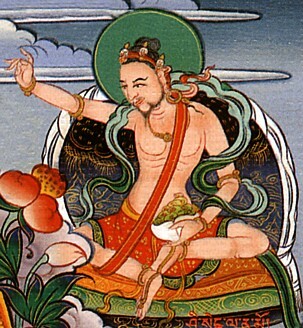 yang gsang bla na med pa'i skor), which is like the whole person, intended for those of exceptionally high capacity—this is the Nyingtik cycle of teachings. "These four great cycles present the Trekchö teachings in a similar way, but where they differ is in the clarity, explicitness and detail of how the Tögal teachings are given. Shri Singha gave the outer, inner and secret cycles of the category of pith instructions to both Vimalamitra and Jñanasutra. He transmitted the innermost secret cycle to Jñanasutra, who then passed it on to Vimalamitra." The root tantra of the category of pith instructions is the 'Reverberation of Sound' Tantra (Tib. སྒྲ་ཐལ་འགྱུར་, dra tal gyur). This page was last edited on 25 August 2015, at 18:48.